Cougar Cub Daycare is currently looking to hire part-time and/or full-time positions. The normal daycare hours are Monday-Friday; 7:30am-5:30pm; closed weekends. Cougar Cub Daycare strives to provide a safe, clean, fun-loving environment where kids look forward to spending their time. We are seeking to add staff that can help provide this kind of environment. We are looking for responsible applicants who are great with babies, toddlers and young children; have a creative mindset in preparing crafts and activities to keep children entertained; assists with meal prep, cooking and cleaning; and communicates well with parents and the daycare board of directors. Interested individuals need to submit an application and resume. Submitted applications to be mailed to: Cougar Cub Daycare, PO Box 353, Bird City, KS 67731; or returned to the Bird City Century II office, 107 West 4th. Applications accepted until positions are filled. Over the past few months, Bird City Century II Development Foundation has reached out to the community through surveys asking about the need for daycare. After voiced concerns of the lack thereof; and knowing that by not having this service has and will defer young couples and families from moving to Bird City, it was decided this was one priority the Foundation needed to focus on. Options and locations were researched, and meetings were held between the Foundation board and Cheylin school board to establish the best plan to move forward. Knowing the school is a vital part of our community, we see many positives that could stem from this addition. 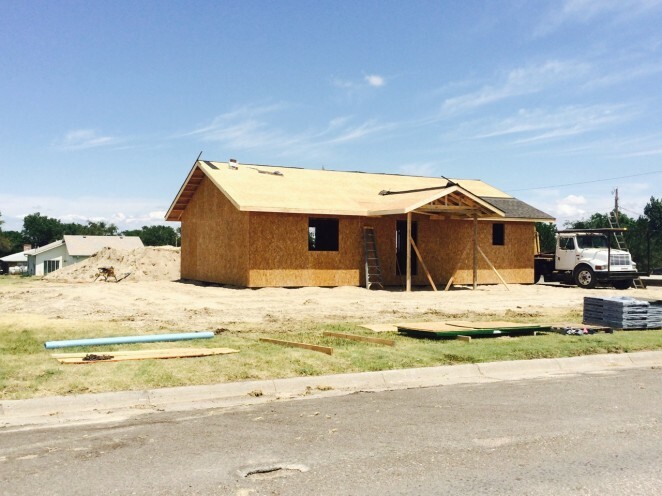 Construction of the new “Cougar Cub Daycare” facility broke ground on June 23, 2016. The facility will be 42’ x 28’; will include a fenced in playground area and an unfinished basement which will be available for emergency shelter while the daycare is open. It will be located north of the Cheylin Elementary School; east of the Cheylin Wellness Center. This location was sought as a convenience for parents, and can be easily utilized for the Cheylin Preschool kids who attend half days at the elementary building. Open anticipation date is September 2016. Bird City was one of 25 applications awarded funding through the Kansas Department of Transportation, Safe Routes to School program. The City of Bird City will receive $200,000 through this SRTS grant, as well as $50,000 through Bird City Century II Development Foundation, for a total of $250,000 to repair and/or add new sidewalks and curbs around Cheylin Schools, along Bird Avenue, and possibly in other sections of town depending on availability of funds. This project will start construction in Spring 2017. 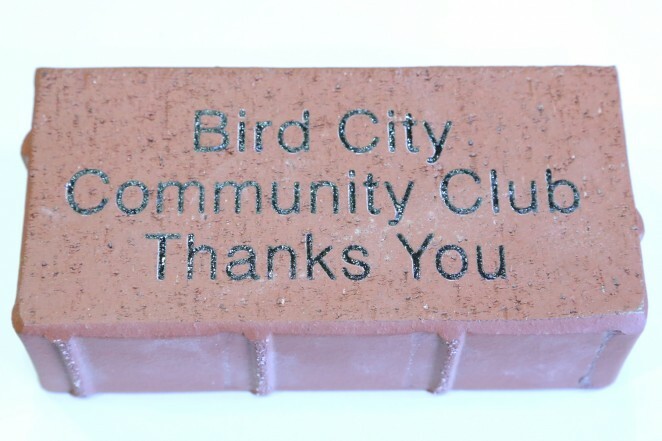 To help supplement this project, Bird City Community Club is working with Cheylin Schools to build a brick donor memorial wall; using personalized laser-engraved bricks purchased by individuals, families, businesses, memorials, etc. Sponsorship donations are $100 per brick, (up to three lines and a maximum of 17 characters per line), which includes a lifetime replacement warranty. If you would like to sponsor a brick, please fill out this Brick Donation Form. You may contact Cindy Burr, Community Club Chair, or Rod Klepper with questions. Bird City has received $15,000 from the Kansas Department of Transportation to implement Phase 1 of the Safe Routes to School Program (SRTS). 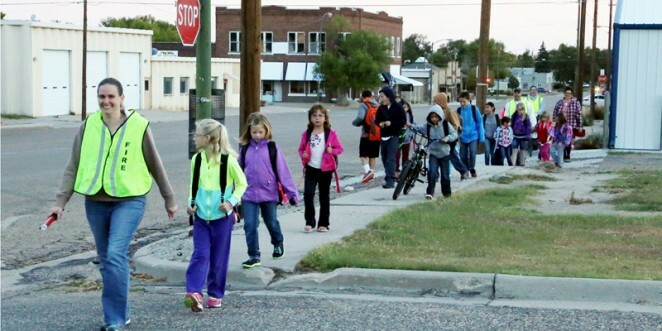 This state program focuses on unsafe sidewalks that children use when walking and biking to and from school; encouraging children to walk or bicycle to school more safely. Funding from Phase 1 of the SRTS Program is to be used to create a SRTS Plan that includes all of the “5 E’s”. The five E’s are Engineering, Education, Enforcement, Encouragement, and Evaluation. This program will allow us to create a walking school bus, conduct surveys and physical audits to identify problem areas, and educate the students on bicycle/pedestrian safety. The end result from Phase 1 will be an action plan to make improvements for the safety of our kids to school and from school, and to apply for Phase 2 which will allow for infrastructure improvements, such as sidewalks and crosswalks. If approved, Phase 2 will be a $200,000 grant award, matched by $50,000 from Bird City Century II Development Foundation. Through the Safe Routes to School (SRTS) project, plans to replace broken and add new sidewalks around the community are underway. McCarty Family Farms, which includes Bird City Dairy, has taken the initiative to assist our local educational systems providing nutritious, delicious, and low cost dairy products to the students and staff. 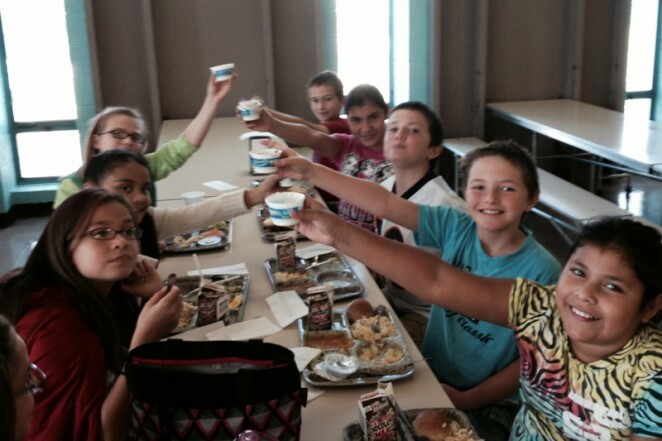 Utilizing their relationship with Dannon yogurt and the local school systems, McCarty Family Farms provides 5,000 individual servings per week to the students throughout the school year. Schools that are currently receiving weekly yogurt deliveries are Golden Plains USD 316, Colby Public Schools USD 315, Heartland Christian School, Sacred Heart Catholic Academy, Cheylin Schools USD 103, Scott County USD 466, Kids Port Day Care and Preschool and Southern Valley School District. Be sure to thank Mike & Amy McCarty with the Bird City Dairy for this AWESOME contribution to our school!!! Oh the wonderful things that this tree has seen throughout the years. Yet sadly, the day has come for a piece of Bird City history to end it’s familiar rein. Unfortunately, the storm last month brought down a large portion of the tree, leaving it in very poor condition. 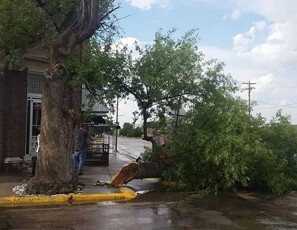 The decision was made last night at a special council meeting to have the tree removed, before it comes down on its own. 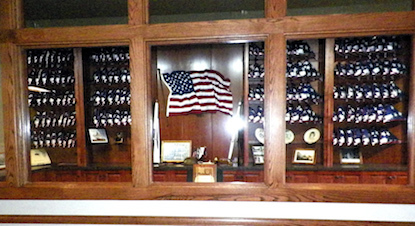 The American Legion Hall underwent a major renovation in 2012, finishing up majority of the construction in early 2013. In the early stages of the project, Howard’s Tri-State Construction out of St. Francis renovated the prior concrete storage space into an additional office for Bird City Century II Development Foundation, along with a maintenance room for the Legion. A new storage room, to house all of the Legion tables and chairs, was then built to the east side of the stage in the Legion Hall. 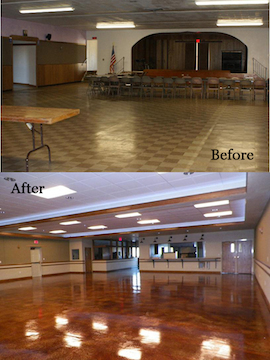 During this construction process, the Legion floor tiles were also completely removed, due to asbestos.In mid-2012, Miller Construction of Goodland continued the renovation project, which included removing the old restrooms in front; making the front entrance area a Flag Memorial Room to honor those who have served for our country; the kitchen was doubled in size as the room to the east became a part of the extended kitchen; and a new concrete stained floor, corkboard walls, and a tiled-tiered ceiling with 5 stages of lighting were added.It has been a big project, but by the numerous events held in the Legion each month, it continues to be a great asset for the community! A community project that took place in Bird City was the construction of the Cheylin Wellness Center. The building is 40′ wide x 80′ long with 10′ ceilings, frame construction, cement siding and a metal roof. The Cheylin Wellness Center is on the lot north of the Cheylin Elementary School. The Cheylin construction & carpentry classes, along with community volunteers did the basic construction. Donations for the Cheylin Wellness Center project (for maintenance of the building or upgrading equipment, as needed) can be dropped off or mailed to: Bird City Century II Development Foundation, 107 West Bressler, PO Box 593, Bird City, Kansas 67731. 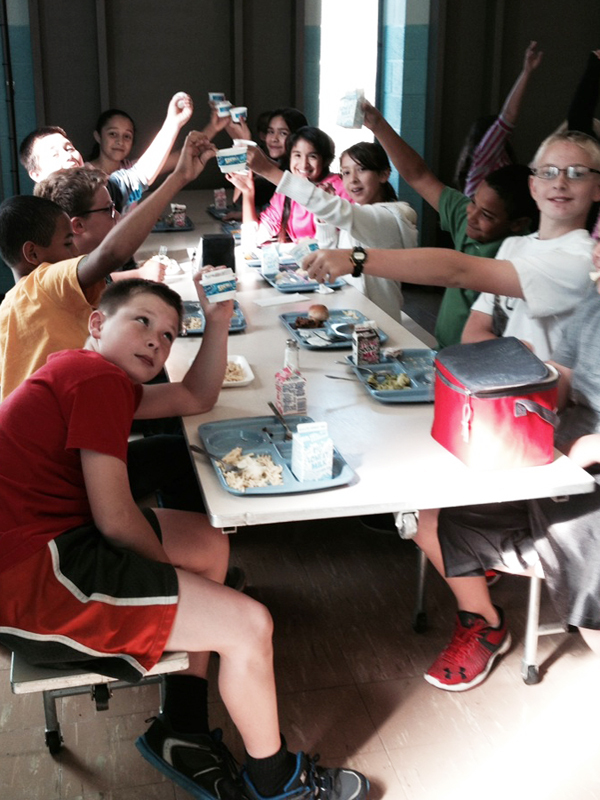 Checks to be made payable to Cheylin Schools Foundation Fund (Memo: Cheylin Wellness Center).